Okay, right off the top we know full well that one click partnership building is not possible. However, during yesterday's Sprint Review, I was able to see the nearly completed One Click Portal Module. Thanks to some serious development effort, we will be able to launch Community Operating System Portals with a click. This is not a small thing. A CommunityOS Portal provides client tracking and case management, resource directory and asset mapping, content management (everything from calendars to message forums, eNewsletters, file libraries and more), and some seven levels of reporting, all of which can be deployed for the specific needs of an agency, or a program, or a stakeholder group, or a specific purpose. Need to focus on Elder Care? What about that literacy initiative, or the Jobs Program? Does your disaster relief team have the private space to plan and the public tools to get out important bulletins? The most important part, of course, is that your information can be either completely private between portals, or completely shared, and anything in between. Thus, privacy can be sustained and collaboration encouraged quickly, easily, and at very low cost. As I've said before, technology is finally approaching common sense. Or said another way, technology is finally able to support the complex, dynamic, and evolving needs that are our communities. As technology becomes ever more powerful and less expensive, we can help to focus resources and assets on the needs of people, not the technology. Pleased to report that we are welcoming a new international customer to our VisionLink network. The Salesians of Don Bosco serve almost three million youth in 131 countries. Their 34,000 staff work to improve the lives of poor youngsters through the teaching of skilled trades and scientific agriculture. There are 225 Salesian orphanages and shelters, 216 hospitals and clinics, 850 nurseries and 3,408 schools around the world. Their US Headquarters is in New Rochelle, NY. The Salesians have selected CommunityOS to help coordinate relief efforts in Haiti; their staff and facilities--and obviously those they serve--were heavily impacted in the Haitian Earthquake. We are proud that they have chose to rely on VisionLink for their mission critical work. Compliments to the steering committee, staff, partners, and 1,300 affiliated agencies and organizations of the national Coordinated Assistance Network. 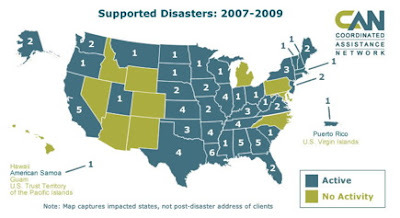 In the map below, you will see the number of disasters, by state, to which the partners of CAN provided coordinated relief during the last two years. It's an honor to support this work--the world's largest multi-agency, multi-jurisdiction partnership. Next month we launch an entirely redesigned infrastructure to support this work. When CAN began, as a way for nonprofit and charitable organizations to work together more collaboratively, I doubt anyone expected this kind of growth, or this kind of rapid acceptance of the coordinated relief model. The new infrastructure deploys regional portals across the nation, with state and disaster specific resources. The communication model supports nation-wide content dissemination, as as well as state, region, and disaster specific content. It makes sense though. The disaster survivor is served much more effectively, donor contributions are leveraged more efficiently, and fraud becomes much more difficult. Well done is all we can say to the many leaders and organizations that have been able to work together so powerfully, and to the American Red Cross, the primary funder. Economic pressures drive the need, and technology is finally approaching a level of common sense. This workshop will focus on portal-based technologies that allow communities to deploy a single technical architecture, yet allow each organization to use their own client management and resource tools. We'll focus on what information should be public, what information should be private, and what information should be shared to drive collaboration among organizations working with shared clients, resources, and/or objectives. We'll also investigate new reporting technologies that allow real-time reports available through dashboards. We already have quite a list of distinguished participants. Clearly, much of the value will be gaining from each others insight and experience. We will also be presenting at NTEN; we find it be an extraordinarily effective gathering of nonprofit leaders and system builders. More as we approach the conference dates. 2-1-1 call centers across the country have completed their annual survey of call traffic. In 2009, these calls totaled more than 16 million calls across America. This is an increase of 13% in call volume over 2008. More than 40% of the 16,235,348 callers had basic human service needs for housing, utilities, food, clothing, personal and household goods. In the basic needs category 27% of the calls were for housing and utilities and 10% for food and meals. Requests for health and mental health services increased to 15% of all calls. VisionLink customers are among those providing 2-1-1 services, from New York to Washington state, from Florida to Maine, and here in our own state of Colorado--and for many regional and metropolitan systems in between. We are particularly pleased to support those partnerships that weave 2-1-1 operations into a more holistic effort, such as when integrated with elder care, homeless management, or disaster response. VisionLink is a strong supporter of AIRS standards (the certifying body for 2-1-1 operations), and was in the fact the first to endorse and to deploy XML based data exchange standards used to move resource information among compliant software providers. 2-1-1 is available to over 240 million Americans – approximately 80% of the United States population –covering all or parts of 47 states, the District of Columbia and Puerto Rico. “2-1-1” was designated by the Federal Communications Commission in 2000 as the national 3-digit telephone dialing code for health, and human community services. 2-1-1 is an easy to remember phone number that connects individuals with resources in their community. With approximately 1.5 million nonprofit organizations in the United States plus scores of government agencies, finding help can be confusing and intimidating. People who want to give help often do not know where to begin. 2-1-1 centers are staffed by trained specialists who quickly assess the callers’ needs and refer them to the help they seek. It’s simple to remember, accessible to everyone at no cost, available 24/7, with multilingual capabilities. 2-1-1 offers information on a broad range of services, including rent assistance, food banks, affordable housing, health resources, child care, after-school programs, elderly care, financial literacy, job training programs and legal services. National leadership for 2-1-1 US is provided by the Alliance of Information and Referral Systems, United Way Worldwide and the 2-1-1 US Steering Committee. 2-1-1 is funded through local and state sources including United Ways and other nonprofits, foundations, businesses, and state and local government. The Calling for 2-1-1 Act, S 211 and H.R. 211 seeks to authorize federal funding through the U.S. Department of Health and Human Services (HHS) to help implement and sustain 2-1-1 nationwide. For more information, please visit www.211us.org. VisionLink’s development team is queued up to focus on another round of enhancements to the Taxonomy Management & Reporting capacities of CommunityOS, and we want your input! Join us for this important Design Studio that is designed for you to provide VisionLink with guidance based on your day to day experiences as we seek to improve on key features to the system. I will be joined by Kyle Kuczun, our CIO, and Craig Quincy, our Software Development Manager. As you know, we've been adding a number of enhancements in this area, and want to make the workflow even easier and more powerful. Note that we are holding a Feature Review on the 12th of February that would be a great session before this one. Please attend both if you can. We just completed a review of 2009 and are pleased (and a bit amazed) to report that we completed approximately 25 major releases last year, along with more than 50 feature enhancements. Some of these were customer specific and many were released to the entire customer base. It is this pace of amazing improvement that allows us to create community-wide solutions, and provide sector-specific solutions (e.g., elder care, HMIS, 2-1-1) simultaneously. This pace of development is a testament to great feedback from customers, a brilliant and tenacious staff, and also to our SCRUM development methodology. Organized into 10 day sprints, our development staff has been working this way for more than two years now, and our effectiveness and efficiency simply continues to improve. For our customers it means that we are more predictable in our delivery schedule, and also that we can be even more responsive when timely opportunities arise, or when disasters strike. As a CEO I've learned not to interrupt the current Sprint, yet, in return we gain significant improvements in our pace, quality, and flexibility. The best part? We have a number of customers who have adopted many of the core aspects of the SCRUM (part of the Agile methodology) for their own work day-to-day. It turns out to be a great way to prioritize weekly and monthly tasks in more general ways as well. If you would like to learn more about SCRUM, go here.